The Midwest may not come to mind when it comes to generating solar power, but the new 12 MW Wyandot solar project in Ohio underlines the fact that large scale solar power projects can be very successful outside of the "sun states", such as California and Arizona. When you think of U.S. states with large-scale solar projects, Ohio is probably not the first state that comes to mind. But supporters of a 12-megawatt photovoltaic system that came on line in Wyandot County in May hope to change some minds about the Buckeye State's solar potential. 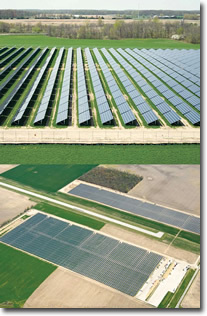 The PSEG Wyandot Solar Farm, located on 83.9 acres of county-owned land adjacent to the Wyandot County Airport, is by far the largest solar power project in the state. 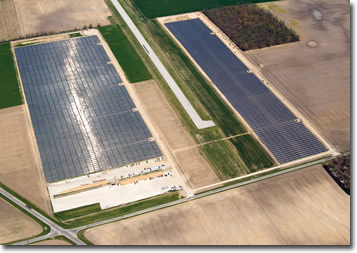 It also is one of the largest PV systems east of the Mississippi River. The project is owned by PSEG Solar Source LLC, part of the Newark, N.J.-based Public Service Enterprise Group. Columbus Southern Power and Ohio Power Co., subsidiaries of Columbus-based American Electric Power Co. Inc., have 20-year contracts to purchase the electricity. "I think solar can be done in Ohio in these types of climates," says Mark Marion, Wyandot solar project manager for juwi solar Inc., the project's developer, primary contractor, and operator. "It's being done in Canada and Germany, which have far worse solar resources than most of the U.S.
"We've definitely used this project to advertise our capabilities in the Midwest and our design to build in this particular area." Eric Romich, Ohio State University extension educator for community economic development in Upper Sandusky, Ohio, views the project as just the start of things to come. "We're fortunate that Wyandot County is the first, but I can guarantee you, we will not be the last," he says. Both Marion and Romich point to recent state legislation as reasons for their optimism. Ohio Senate Bill 221, signed into law in 2008 by Gov. Ted Strickland, establishes renewable energy portfolio standards. It requires that at least 12.5 percent of the state's electricity be from renewable sources by 2025. The legislation also requires that at least half of that renewable energy be generated within Ohio, and the other half be generated within neighboring states. Ohio is the fourth-largest user of electricity in the nation, behind Texas, California, and Florida. Not only is the Wyandot County project a leader in terms of size, it is also one of the tops in terms of the short period of time it took from concept to coming online, Marion says. Responding to an RFP issued by American Electric Power, juwi solar initially approached the Wyandot County Office of Economic Development in January 2009 about the possibility of siting a large-scale solar project in the area. Boulder, Colorado-based juwi eventually was awarded the project. In addition to working at Ohio State University, Romich also happens to be the director of the Wyandot County Office of Economic Development. In that role, he helped juwi solar locate feasible sites, work with local governmental agencies, and obtain the necessary permits. Once the project was approved, Romich also put together forums to help educate the public about the project and its benefits to the communities. "The Power Purchase Agreement was signed in June 2009, and the project achieved commercial operation in May of 2010," Marion says. "We believe that this timetable to completion is industry-leading and tip our hats to all of our partners who worked tirelessly to achieve this milestone." Once the project had a definite site and permits, juwi solar sought an equity investor. 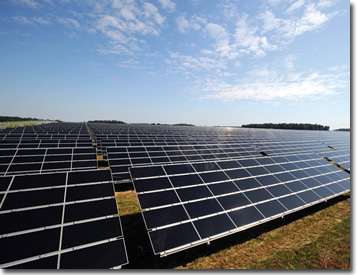 PSEG Solar Source was the successful bidder. juwi solar acted as the primary contractor, which included permitting, design, engineering, and procurement. The project involves 159,200 FS-2 solar panels from Phoenix-based First Solar. Most of the panels were actually built in Perrysville, Ohio, greatly easing transportation logistics, Marion says. Sourcing such a large number of panels was not a challenge because of the long-standing relationship juwi solar has with First Solar that dates back to juwi's parent company in Germany, Marion says. juwi engineers decided to go with a ground-mount system rather than a tracking system because of economics and location. "The amount of additional energy a tracking system collects depends on the area of the country," Marion says. "It costs extra to track the sun, so that sun better be paying you back to make it worth it." They have found that in areas with less insolation, or sun exposure, the fixed systems make sense. Vaughn Industries Inc., also based in Wyandot County, was the electrical contractor. Although the company had no experience with large-scale solar projects, Marion says the firm had a reputation for quality work. "This was their first, but this is something we've become comfortable with because frankly, there aren't a lot of contractors experienced with large-scale solar," he says. "That is why we can do things efficiently. The way the systems are put together is, from the electrical standpoint, very basic. So when you break it down to the tasks that the electricians will be doing, it's stuff they have been doing all of their lives. "Anything that is unusual from an installation standpoint is where we have expertise, and we can explain to them that it needs to be done in a particular way and the reasons." Brian Tschanen, division manager for Vaughn Industries in Carey, Ohio, says his company has extensive experience as a commercial electrical contractor, constructing power substations, power lines, HVAC, and airport lighting, to name a few. Therefore, much of the work on the solar farm, except for mounting solar panels, was similar to what the company does daily. The electrical contractor was involved in the project on the front end with Tschanen, project manager Drew Roach, and the Vaughn Industries team estimating the project. Vaughn's responsibilities included sinking 12,736 array posts into the ground, attaching 3,184 array racks, and mounting the 159,200 modules. The firm also built a four-mile 12 kilovolt connection line from the solar farm to an Upper Sandusky AEP substation. In addition, Vaughn expanded the substation for AEP, including adding a second breaker to the facility, Tschanen says. juwi went with racking systems designed and built by Schletter Inc. of Tucson, Arizona, also because of long-standing relationships the two firms had, Marion says. In addition, the Schletter systems are up to 70 percent pre-assembled at the plant, so they can be installed more efficiently onsite. The project also included sixteen SC630HE Sunny Central inverters from SMA America LLC of Rocklin, California. Construction began in the fall 2009, and the project went online in May 2010. That meant crews worked right through the winter. "I think if you ask any of the guys who installed the modules, it wasn't a particularly fun winter," Marion says. "But they did a great job. The winter slowed things down a bit, but it wasn't problematic." Roach agreed, saying being an Ohio-based company was an advantage because they knew what to expect from winter weather. Nevertheless, they were able to keep the project on, or ahead of, schedule with daily communications among the management team. "They were on site tracking the progress day to day, and they knew what marks we had to meet," Tschanen says. "It was just a team effort from everyone to hit the numbers we needed to get and to improve on a day-to-day basis." The project actually was completed ahead of schedule and should provide Vaughn Industries with a stepping stone to future solar projects, Romich says. "They (juwi) were blown away with the work ethic and professionalism of Vaughn Industries," he says. "They were two to three months ahead of schedule and on budget. "I think when you have that type of recognition about the workforce and the quality of the work of an electrical contractor, certainly it gives us a good step up. We're very excited locally because it's offering a whole new market for a local business." The Ohio solar farm also should demonstrate the feasibility of solar generation to other Midwestern states, Romich and Marion say. As part of the arrangement, juwi agreed to install 43-kilowatt PV systems on each of the three high schools in the county. The systems not only will provide electricity to the schools but also serve as the focus of their educational curriculum. "These kids are going to be growing up with the largest solar system in Ohio and one of the top 10 to 20 solar systems in the country," Marion says. "They should know what's going on with solar energy."